Thread: I'm out of sorts! but I sat down to attach the binding and look what I saw. Trimmed down to the points rather than 1/4" allowance. Maybe I have too much time on my hands if I'm cross about it...but...rats. I would be more than "cross"!!!!! Oh how frustrating! All your hard work and accuracy is lost along the edges. Just trying to make light of it, sweetie. I know you are not happy about it. That is not acceptable. I would atleast talk to her. OMG .... I really feel for you on this. After all your hard work and to have it totally ruined. Sadly not much can be done at this point to fix all those missing points. Don't let it go by the way ... if close enough drive right back and discuss IRL. Otherwise, call and find out what and why. At the least, her FMQing should be rebated to you. However, there is a huge loss in the fabric costs and your labour. ..... talk to her and see what can be worked out. Maybe she was trying to square up the quilt? She should of called you first. I would let her know you're not happy. That is so disappointing! why would she trim it in the first place? she wasn't going to bind it. ask her. hopefully she will have a good answer, otherwise, find another long armer. Go ahead and finish it, it will not look that bad. it just frustrating. Why would the points be cut off? Oh my! I am thinking some one in her family helped her.... maybe. Although the points are indeed cut off, this lovely quilt is definitely not ruined. Unless you planned to have it judged, just finish it up and enjoy it or gift it whatever your plan was. Blunt points are not the worse thing, especially if they all are. Then it becomes a design element! Please do contact the longarmer as she has done satisfactory work for you in the past. I am a long arm quilter and I won't trim down a quilt just in case I messed up like that. I would much rather give the finished product back to the quilter to trim down themselves. I would talk to the quilter about it. it isn't ruined, I know that. And I'm over it now. But I haven't shown quilts since the 90s and I had thought to put this one in a show this fall. Serves me right for being prideful. I'm 1/2 way around now so only 190" to go. I saw a piece on youtube about Missouri Quilt Co, the owner was showing the quilts on their machines and she said she has three women employed full time doing binding. All of them can do 2 queens and 1 king in a day! They will never hire me, I'm the turtle when it comes to binding. And on the other side of this quilt is another top, and it doesn't have any points on the edges Looks fine bound.! This is unacceptable. Did you ask her to trim it? Not only the triangle points, but the entire design is altered at the edge. In your photo you can see the parallelogram at the edge is much narrower than one inside the quilt. I would definitely ask for my long arming fee back. I would never trust someone else to trim my quilts. This is the very reason that I never trim the quilts I quilt for clients. They trim their own. I am so sorry but for what it is worth all will be well. The quilt is beautiful. I feel terrible for you. I still love the quilt though. It's beautiful. Originally Posted by Patricia M.
This is what I was thinking too but the pattern should take precedence over the squaring up or she should have left all or some of the border on for the quilter to decide what to do. 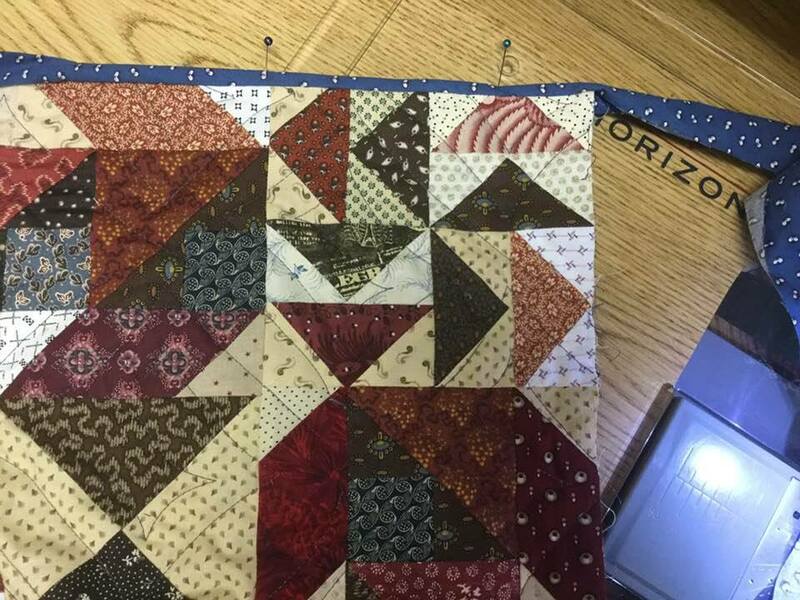 Is it possible that she trimmed from "the other side" quilt and didn't realize points were cut off? I had one quilt long-armed and the quilter trimmed the quilt to the edge - on the pillow shams - that did not matter - she left two inches of batting and backing! What was done to your quilt was a screw-up - not life threatening, but extremely - polite vocabulary fails me. KalamaQuilts, I admire your forbearing attitude. If that's the quilt I think it is, it is a masterpiece and should have been handled with utmost care. I just don't understand what she could have been thinking. Maybe she is out of sorts and should take a break until she is back with it. Oh, how disappointing (or should I say dis-pointing?). I don't think I would have gotten over it as quickly as you have. Especially not a quilt I had considered showing. The LA made a very careless mistake, and I think you have every right to ask for all your money back. It could've been an honest mistake (as someone suggested maybe she trimmed from the reverse side ?) but she should compensate you for her mistake. The quilt is really pretty, as are all your quilts. I envy your skill and patience. Kalama- I’m sorry this happened to your quilt. It seems to me that the long armer made a serious mistake here and needs to know about it, otherwise it may happen to someone else’s quilt. I’d want a refund if it was my quilt. Last edited by rryder; 05-15-2018 at 02:14 AM.